was very close to the people he was around the most and could ignore you better than anybody I have ever seen in my life. I knew that although it didn’t look like it at the surface there was something different about him. So at 9 months old I asked his doctor to have him tested. I personally thought he was deaf. She told me that at his age it was too soon to have him tested for anything but at 15 months old if things had not changed then the testing would begin. 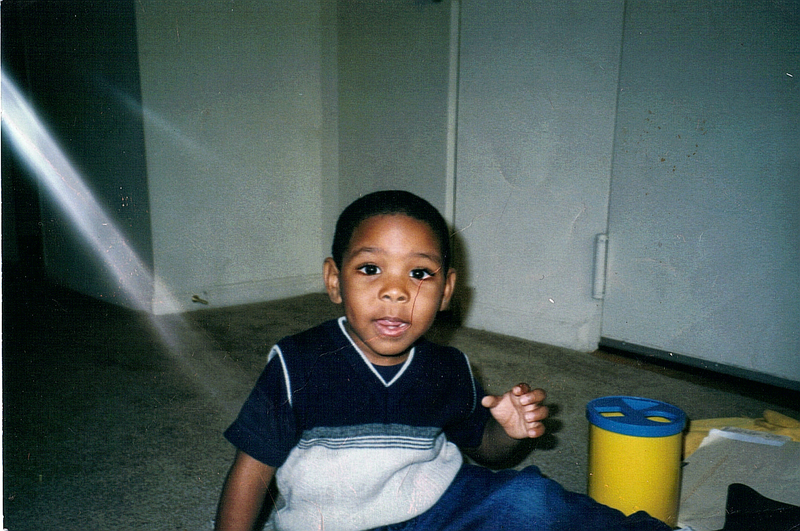 So at 15 months old Demetrius went through a series of test. These tests went on for months. About 7 months if I had to give a number. When the results came in it wasn’t what I thought but something that I thought at the time was much worse. My son was diagnosed with Pervasive Developmental Disorder or PDD. What is PDD? It is a group of disorders characterized by delays in the development of socialization and communication skills. Autism (a developmental brain disorder characterized by impaired social interaction and communication skills, and a limited range of activities and interests) is the most characteristic and best studied PDD. Other types of PDD include Asperger’s Syndrome, Childhood Disintegrative Disorder, and Rett’s Syndrome. Children with PDD vary widely in abilities, intelligence, and behaviors. Some children do not speak at all, others speak in limited phrases or conversations, and some have relatively normal language development. Repetitive play skills and limited social skills are generally evident. Unusual responses to sensory information, such as loud noises and lights, are also common. When I first heard this I thought I would die. I thought his life would be so hard and I would have to live forever to protect him from the horrible people in the world. He couldn’t talk so we were going to have to learn sign language. I really thought whatever the worse that could happen with him; would happen with him. The Maryland school system was very instrumental in the last phases of his testing and they were the ones who gave me his diagnosis. They were also the ones who gave me hope. They immediately started in-home schooling with Demetrius and by the time he was two years old (two months after his diagnosis) Metrie spoke his first word, it was Mayonnaise. We were so excited. He didn’t even give us the chance to learn past the basic please, excuse me and thank you of sign language. It was amazing. My baby started school and excelled he got better and better every year. There are meetings his dad and I attended called Individualized Education Program or IEP for short that provided a detailed view of how they would help him in learn in school. It provided services like giving him breaks in class or a dedicated assistant to help him during a class if he needed it. Demetrius was blessed with great teachers who took great interest in him. He was aware early when he couldn’t handle things and he had no problem telling the principle of one school that he attended that he was not focused enough to work alone. He was seven when he said that. With the exception of maybe one maryland school I have cried knowing he had to leave it. I always wanted his teachers to come with him. It is such a blessing because they really are following him and keeping tabs on him. Now here were are 13 years later. He is the best reader in his class, an excellent speller and gets upset if he gets a C on his report card. I used to think that I would have to protect Demetrius more than I do my other children but he is teaching me that he is going to be just fine. Happy Birthday Demetrius I am so VERY proud of you and the young man you are becoming. You will do great things in this world. I love you. I have talked about how large my family is since I started writing this blog and so far it is proven to be even larger than I could ever imagine. According to my family tree my great grandparents have 501 descendants. That is even more than I originally thought. Wow, I was always saying like 450. Anywho we are bigger and growning everyday. So there is no wonder as to why I want us to know who we are. 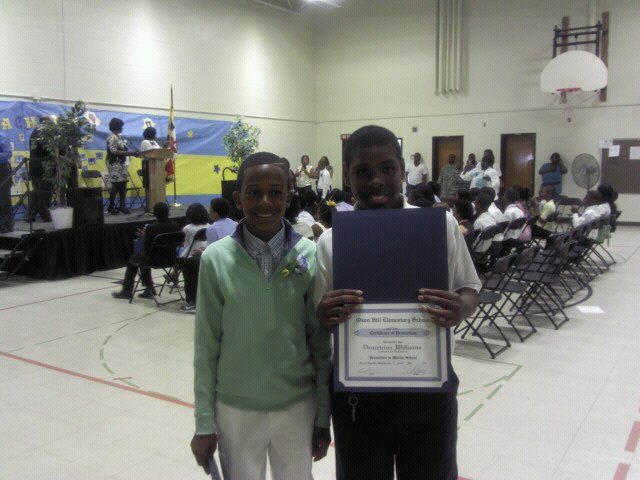 On June 7th my son Demetrius had his promotional ceremony from 6th to 7th grade. I was so very proud of him. Like all children do my son had a little boy that he was not fond of in his class. He and this little boy would always get into arguments. See it is easy to anger Metrie because he is autistic so the slightest things (depending on the day) could really tick him off. Well we learned that they were actually cousins. I saw Jionne’s (or as Metrie calls him JT) grandmother and asked her what was she doing here. She said she was coming to her grandson’s graduation. We talked and it seemed they were in the same class but would not be sure until JT’s daddy came to let us know. We talked and learned that JT was in a classroom full of boys (same as metrie) and that JT’s teacher was a man (same as Metrie). It was way to coincidental. When David got there I asked him what was his JT’s teacher’s name and it was confirmed JT and Metrie who fought all the time were cousins. Because their last name are both Williams they were beside each other when receiving their certificates. As they came down we took pictures of them and then called them over and explained to them that they were cousins. The surprise on their faces were priceless. My son said we were enemies but now we are cousins and they hugged each other. It brought tears to mine and JT’s grandmother’s eyes. This was not the first time this happened. My daughter went to high school with her cousin for four years and we didn’t find out until their graduation day.